Assumption College Library received two notable donations from the Union Saint-Jean-Baptiste of Woonsocket, Rhode Island. The first was the Mallet Library Collection. This book collection is a unique and fascinating collection of 18th, 19th, and early 20th-century works on French Canadians, Franco-Americans, and Native Americans**. 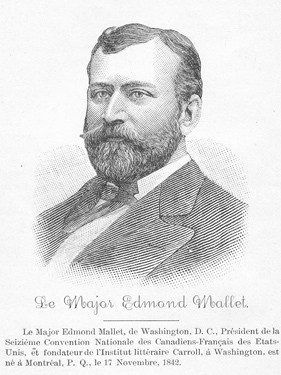 These materials comprised the personal library of Major Edmond Mallet (1842-1907), a Franco-American Civil War veteran from Oswego, N.Y., who served as Inspector General for Indian Affairs under President Grover Cleveland. This collection of 6,000 items incorporates materials relating to the French exploration and settlement of the New World, as well as rare documents relating to Native Americans. The dichotomous nature of the collection reflects the two primary interests of Major Mallet: his French Canadian heritage and the integration of New World settlers with existing Native American settlements. The second donation was Major Mallet’s personal papers, including a group of photographs and papers from the late 1800s regarding life of American Indian children and adults who lived on Indian agencies and at missionary schools in Indian Territory. These resources were collected by Major Mallet while he was working as Indian Agent at Tulalip Agency in Washington Territory from 1876-1877. Mallet was later appointed Indian Inspector and Special Disbursing Agent in the summer of 1888 by President Grover Cleveland. As Inspector, Major Mallet visited and reported on conditions at one dozen Indian agencies and schools in the Dakota Territory, Oklahoma, and Nebraska. The majority of the photographs and documents in this collection are taken at the agencies and schools. Tribes include Tulalip, Cheyenne, Arapahoe, Genoa, Yankton Sioux and Rosebud. The materials are comprised of over 70 photographs and over 300 pages of documents. These documents include correspondence, agency documents and American Indian employment records. L'Union Saint-Jean-Baptiste d’Amérique, a society dedicated to Franco-Americans and French-Canadian ancestry, acquired the collection in 1913, six years after Major Mallet’s death. The U.S.J.B., now part of Catholic Financial Life, gifted the library collection to Emmanuel d'Alzon Library in March 2004, followed by the papers and photograph collection in December 2013. To browse images from the photograph and manuscription collection, click here. For a full list of items from the entire collection, click here.